I believe in a third culture. Finding out I was white came as quite a shock. After four and a half years of believing I was Salvadoran, my nationality was revoked. Everyone around me thought it was so funny that I had mistaken my very fair skin as brown, and my very blond hair as black. Kids. They’re so cute. They laughed and I let them, neither one of us realizing quite the impact that moment would make. When my family moved back to The States, I went ahead and conformed. I unconsciously forgot an entire identity; I let go of my Spanish, forgot El Salvador, and attempted to proceed as usual. I faked it very well—for most of my life I even had myself convinced that I was American. Yet something just wouldn’t click. There were so many aspects of life in the US that I tried desperately to distance myself from; I began to hate the association, wondering why there was so much I didn’t understand and so much I couldn’t get other people to understand. I looked the part, but I couldn’t play it. Just hearing someone say “El Salvador” made me jump, desperately trying to become a part of the conversation. I kept meeting girls from San Salvador who didn’t understand why I considered their country to be mine as well. I didn’t even speak Spanish anymore, so in most eyes I had no credible claim to the Latin American culture. Even I started feeling like I didn’t, and between losing a nationality and a language, I lost a big part of who I was. It is only recently that I began to come to terms with the fact that I don’t really belong to any culture. And it was in expressing this to someone that I found out there was a third culture, for people who felt just like me. Being classified as a “third culture kid” means living outside your passport country for a significant portion of your developmental years. Essentially, TCKs are people who don’t have a country because they were never able to firmly establish their roots. When asked, most people can tell you where they are from. I can tell you where I live, but where I’m from has always been tricky. Because, true to the TCK formula, I’m not from anywhere. I belong to two countries, two cultures, two languages. I cannot define myself by either one, and I learn everyday that I don’t have to. I’m developing an entirely new perspective, coming to understand that weaving together both parts of who I am connects me with people on an entirely different level. Suddenly I understand the plight of the foreigner, I get the loneliness of the outcast, I appreciate the importance of origin—and it isn’t merely from an empathetic standpoint. I am on the same journey of self discovery, to reclaim my identity, and it has been incredible to see just how many others are on it too. I believe in getting yourself in over your head. I can say with all honesty that the best decisions in my life have been made during situations of extreme discomfort or duress. These have been times when I was confronted with new and sometimes frightening circumstances, often of my own making and sometimes quite intentional. Eleanor Roosevelt once quipped, “A woman is like a tea bag- you never know how strong she is until she gets in hot water.” Thanks to these trials, I have learned the true strength of my intelligence, patience, and perseverance. The first time I was truly tested was at the age of 23 when I was married to an alcoholic and became pregnant. Up to that point, my life had been an aimless string of events and dead-end jobs, a period of time marked by a distinct lack of concern for my present and even less concern for my future. With the unexpected appearance of a “+” on the test strip, I instantly realized the gravity of my situation. Everything had changed. It was time for me to step up, whether I felt ready or not, because life was no longer just about me. The subsequent 2 years of my life were an arduous metamorphosis. I managed a healthy pregnancy (without insurance), I gave birth to an 8 lb. baby (at home), I got a real grown-up job at an insurance company, and I divorced my husband. It was scary, it was difficult, and it was absolutely worth it. More recently, I have intentionally created situations where I had to succeed under threat of fantastic failure. In the last 4 years, my life has undergone yet another total metamorphosis. After working in the marketing department of that same insurance company for over 5 years, I realized a change had to happen. I wanted more from life and it was time to challenge myself again. On a whim, I bought a house from my (new) in-laws and moved my family to Fort Worth. After trying for 10 months to find local employment, I eventually quit my steady job in Austin and went back to school at the age of 30. The increased responsibility of a mortgage and the decreased security of a steady corporate job have made for some ulcer-inducing months, for sure. More than once I have wondered if I am being unreasonably selfish by pursuing my education at the expense of the financial security of my family. My parents never went to college, so I am striving to set a good example for my girls by getting my degree. I can only hope my daughters see how hard I am trying and are internalizing the same work ethic. I know this is not the last time I will challenge myself. Even at my advanced age (31! ), I will have many more opportunities to get myself out of (self-inflicted) hot water. I may not always succeed, but I am certain I will be better for having tried. My life was changed the day I first moved. I had been living in Louisiana for practically my entire life when my father told the family that he was being transferred overseas to Great Britain. We moved to a small village called Lea that was just two hours away from London, and I went to school surrounded by people who had funny accents and strange habits. We also went to a different church, an Anglican one I suppose, but honestly I could barely tell the difference then from the Methodist church we had attended in Louisiana. Church was never a big part of my family’s life. We arbitrarily went from Methodism to Anglicanism simply because it was convenient (the Anglican Church was right down the street). And when we then moved to London itself, we stopped attending church for a year because we could barely find a school for my sister and I, let alone a place of worship. But none of this was a big deal because religion and spirituality never really entered my life in England. It only became an issue when I moved to Texas. I started noticing how deeply people held their religious beliefs, and how open they were to talking about them. All through high school I was surrounded by people who would mention God or Jesus whenever they got the chance, and I always got offended by it. I just always believed that religion was a private matter, and definitely not something you just openly talked about in class. And when I got to college things just got worse. Now I was living with people of all different faiths and ideologies, and so naturally clashes occurred between the intolerant people. I hate intolerance. Living in England taught me that people can be different from me, but still be great once you get to know them, and so when the intolerant people in my dorm would go about preaching their beliefs I just couldn’t believe it. Did they not realize how rude they were being? Did they not understand how offensive they were? After a few heated arguments, I realized that the people who are the most intolerant happen to be the most ignorant of other people’s beliefs. These people practically refuse to accept that their religion maybe isn’t the only correct belief out there, so they attack anything they don’t understand. I believe in understanding. I believe in empathy. I believe in tolerance and freedom. But I also know that some do not. I know that some refuse to learn about “the heathens”, that some hate those that are different simply because they are different. And I know I can’t do anything to change that mindset. So instead I choose to take the higher path, to not hate them because of their hate, their ignorance. I believe in empathy, they believe in intolerance. But I hope that just as racism has slowly began to die away, so too will the last vestiges of all intolerance. I hope I am not wrong. I view saying goodbye the same way I view doing chores. Nothing but bitterness arises when my parents tell me to take out the trash, water the garden, or even mow the lawn. However, regardless of how long I procrastinate, or how much I may dread the obligation, I always end up pulling through. Those same distasteful thoughts and feelings reappear every time I have to bid farewell to somebody. It’s strange though. Whenever I complete a task around the house, I always wind up with a weird sense of satisfaction. Interestingly enough, I experience that same satisfaction after I say goodbye to someone. But it just doesn’t add up! Aren’t farewells supposed to be sad? I used to believe so, until one night with my best friend proved to me that goodbyes are just temporary and they will never leave permanent scars. I had known Bailey for three years, but we never really became close friends until this past summer. As my feelings for her began to grow, it became much harder for me to even contemplate saying goodbye. Nevertheless, I continued to spend as much time with her as possible until my doomsday finally arrived. Little did I know that day would become a memory that will forever be ingrained into the inner walls of my subconscious. I can still remember her lowering her head into my chest as she wrapped her arms tightly around my waist. I could also hear the sound of her sniffling over the passing cars that raced back and forth along the road behind us. Feelings of anger, sadness and frustration began to rush through my veins as I fought every urge in my mind and body to let go. As much as it killed me on the inside, I knew that in order to move along the path of my life and pursue my dreams, I simply had no choice. Saying goodbye has never been easy for me, and like a chore I had waited until the last possible moment to gather the strength necessary to face my fear. Something wasn’t right though. Throughout my life, I had always succumbed to sadness whenever I needed to bid farewell to somebody. But this farewell was different. The bitter feelings I had been so accustomed to were nowhere to be found. I was happy! Was I losing my mind? How could I feel this contempt about leaving somebody I had shared so many memories with? Suddenly, it hit me like a freight train. With each task completed comes a new task left unattended, just like each farewell brings with it more to come in the future. I knew I would see her again, and although I’m still not sure when that time will come, I learned that there is always good to find in a goodbye. Street food. One-way plane tickets. Rope swings. If you don’t do it now you’ll regret it for the rest of your life on repeat in my mind as I untie my shoes, roll up my jeans, and run to dip my toes in frigid ocean water. Mountain climbing, thesis-writing, cross-country moving, things that seem too big to undertake that somehow become smaller and smaller in size with every step. Slacklining, skinny dipping, snowshoeing, trying new things to make sure that I’m not missing out on the most important thing, that one experience that will bring more joy and pride and excitement than I could ever imagine. I believe in taking risks. I believe that it’s okay to study abroad in Spain even if you’ve never taken a Spanish class because by the end of your journey you might just leave pieces of your heart swirling in cups of ruby-red sangria. I believe that it’s possible to convert an electric clothes dryer cord from four prongs to three with just a few words of encouragement from the man at the hardware store (and a quick phone call to dad) and that converting that power cord might just make you more proud of yourself than the day you graduated from college. I believe that when you drive down the coast of California, you should observe one rule: stop whenever and wherever you want. That way, you can stick your finger in hundreds of slippery sea anemones while starfish in every color watch. And even if you are late to your final destination, it’s good, it’s really good, because that sun setting over the Pacific is spectacular. I believe in staying up too late the night before a big exam because having a conversation with that boy, that sweet boy, seems more important that bivariate data analysis and maybe, just maybe, you’re going to marry that boy someday. In a few short months, that sweet boy and I will join the Peace Corps, pack up our entire lives into four suitcases, and move to Morocco. This seems like one of my biggest risks yet, but it certainly won’t be the last. Not if I’m lucky. Because I believe that there are too many beautiful, wonderful things on this ever-spinning planet and that the only way to soak it all up, to feel the heartbeat of the earth pulsing in your veins, is to try as many of those things as you can every chance you get. 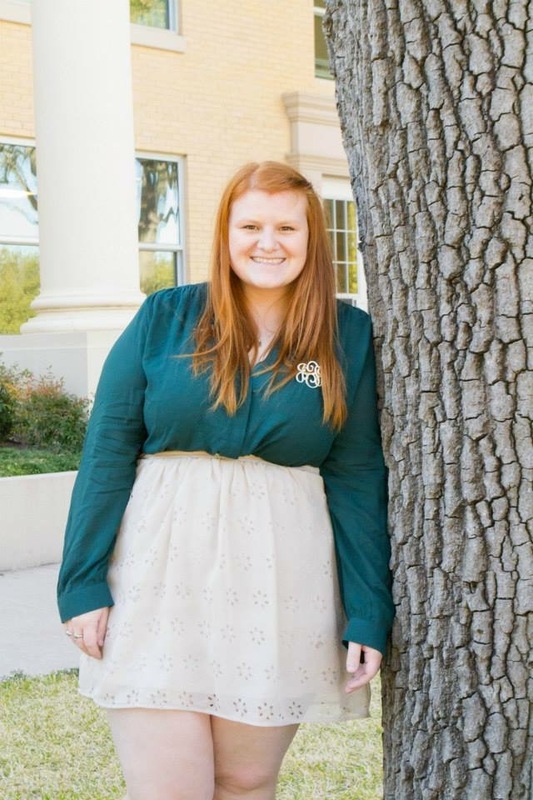 Britt Luby is an Associate Chaplain in the Office of Religious and Spiritual Life at TCU. A graduate of TCU and the Graduate Theological Union, she served as a US Peace Corps Volunteer in Morocco.